徐少卓, 王晓芳, 陈学森, 沈向, 尹承苗, 毛志泉. 高锰酸钾消毒后增施木霉菌肥对连作土壤微生物环境及再植平邑甜茶幼苗生长的影响[J]. 植物营养与肥料学报, 2018, 24(5): 1285-1293. XU Shao-zhuo, WANG Xiao-fang, CHEN Xue-sen, SHEN Xiang, YIN Cheng-miao, MAO Zhi-quan. 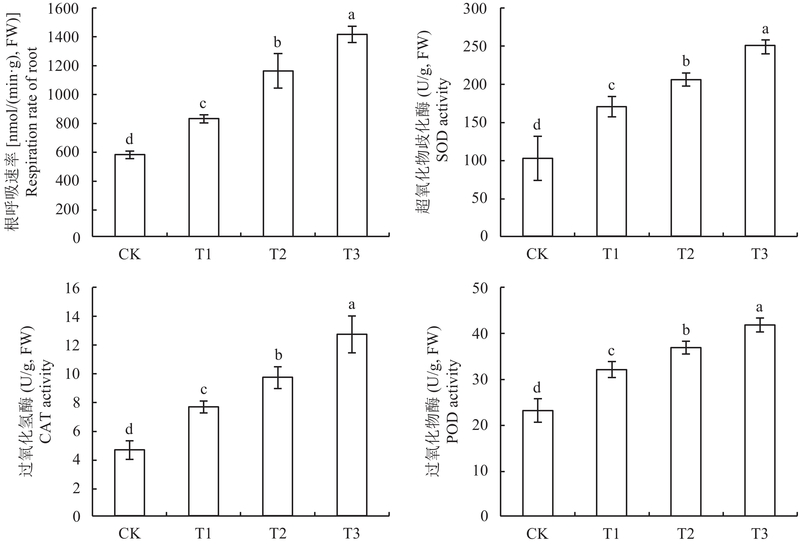 Effect of Trichoderma fertilizer applied after disinfected with KMnO4 on the soil microbial environment and replantation of Malus hupehensis Rehd. [J]. Journal of Plant Nutrition and Fertilizers, 2018, 24(5): 1285-1293. Effect of Trichoderma fertilizer applied after disinfected with KMnO4 on the soil microbial environment and replantation of Malus hupehensis Rehd. Abstract: 【Objectives】 To provide the basis for preventing and controlling apple replanting disease, theMalus hupehensisRehd., which was planted in pot with a Trichoderma fertilizer applied after disinfection with KMnO4, was tested on the effects of the replanted soil environment and seeding growth. 【Methods】 The pot experiment had 4 treatments, i.e. CK (old orchard soil), T1 (applied Trichoderma fertilizer), T2 (disinfected old orchard soil with KMnO4), and T3 (Trichoderma fertilizer applied after disinfected with KMnO4). All pots were filled up with the same soil from a 27 years old apple orchard. The biomass, antioxidant enzymes, photosynthetic parameters and soil microorganisms were determined using a real-time quantitative (q-PCR) and terminal restriction fragment length polymorphism (T-RFLP) methods. 【Results】 Compared with the old orchard soil control (CK), the biomass amounts of M. hupehensisRehd. seedlings were improved in the Trichoderma fertilizer (T1), disinfected old orchard soil (T2) and Trichoderma fertilizer applied after disinfection (T3), and the T3 treatment had the most significant promotion effect. The results of September showed: compared with T1 treatment, the plant height, ground diameter, fresh weight and dry weight of the T3 treatment were increased by 34.0%, 30.9%, 34.9% and 33.7%. Compared with T2 treatment, those indices were improved by 22.5%, 23.0%, 21.7% and 17.3%. Meanwhile, the root activity and the antioxidant enzymes including superoxide dismutase(SOD), peroxidase(POD), catalase(CAT) of the T3 treatment were significantly increased compared with T1 and T2 treatment. 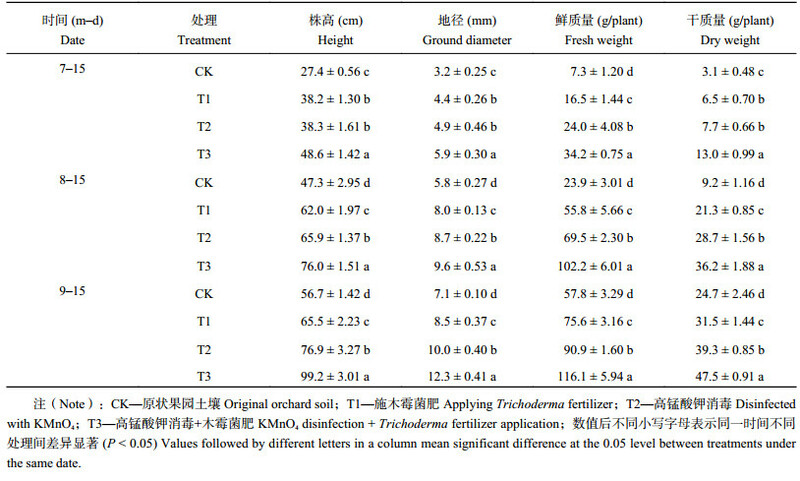 In addition, T3 treatment also optimized the soil microbial environment to a maximum extent. 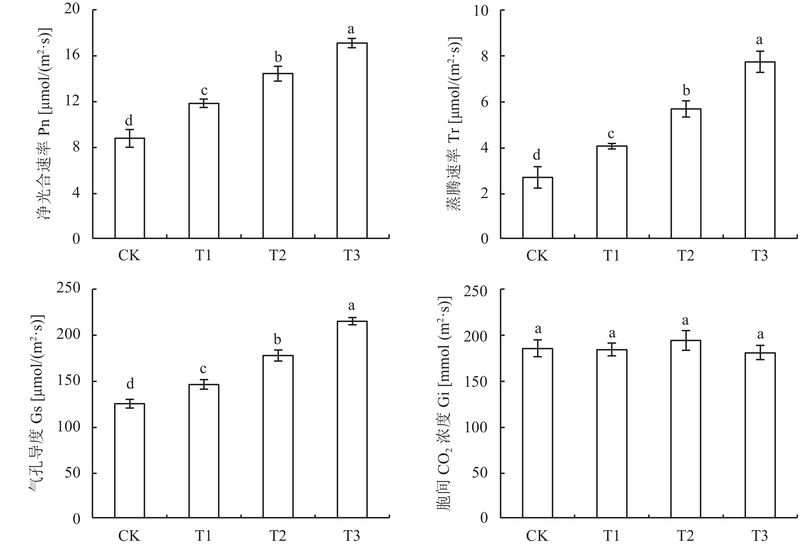 The absolute quantitates of Fusarium oxysporum and Fusarium proliferatum were reduced by 69.7%, 64.4% compared with the old orchard soil (CK), which were reduced by 50.0%, 49.7% in T1 treatment and 29.8%, 29.3% in T2 treatment. 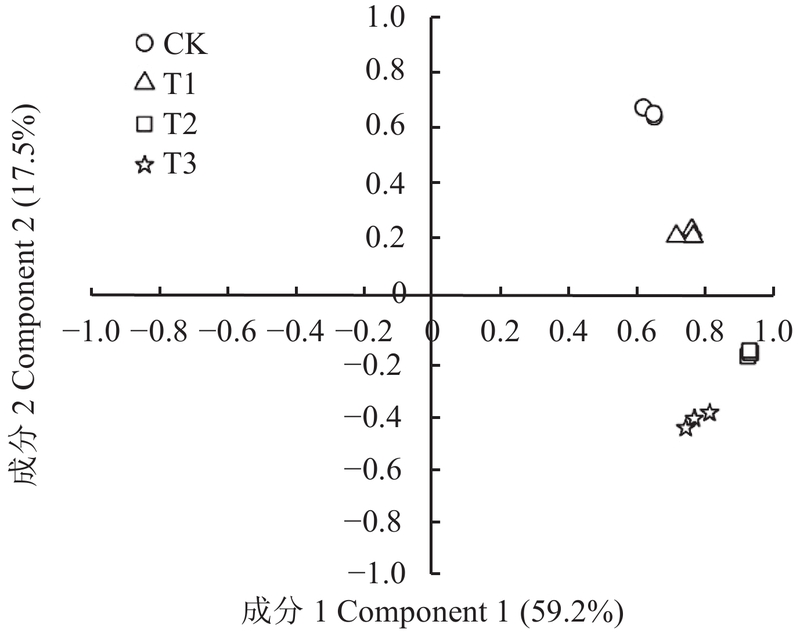 Principal component analysis of T-RFLP (PCA) showed that the Trichoderma fertilizer applied after disinfection (T3) significantly changed soil fungal community structure and especially reduced the apple replant disease (ARD). 【Conclusions】 The treatment with Trichoderma fertilizer applied after disinfection by KMnO4 significantly changed the soil fungal community structure, improved antioxidant enzymes activity, reduced amount of Fusarium oxysporum and Fusarium proliferatum, and promoted the growth of M. hupeheusisRehd. Key words: apple replant disease (ARD) KMnO4 Trichoderma fertilizer microorganism Malus hupehensis Rehd. 注（Note）：CK—原状果园土壤 Original orchard soil；T1—施木霉菌肥 Applying Trichoderma fertilizer；T2—高锰酸钾消毒 Disinfected with KMnO4；T3—高锰酸钾消毒+木霉菌肥 KMnO4 disinfection + Trichoderma fertilizer application；数值后不同小写字母表示同一时间不同处理间差异显著 (P< 0.05) Values followed by different letters in a column mean significant difference at the 0.05 level between treatments under the same date. 陈学森, 韩明玉, 苏桂林, 等. 当今世界苹果产业发展趋势及我国苹果产业优质高效发展意见[J]. 果树学报, 2010, 27(4): 598–604. Chen X S, Han M Y, Su G L, et al. Discussion on today’s world apple industry trends and the suggestions on sustainable and efficient development of apple industry in China[J]. Journal of Fruit Science, 2010, 27(4): 598–604. 孙波. 腐植酸对高锰酸钾氧化酚类化合物的影响机理探究[D]. 哈尔滨: 哈尔滨工业大学硕士论文, 2013. Sun B. Mechanism investigation of the influence of humic acid on phenol oxidation by permanganate[D]. Harbin: MS Thesis of Harbin Institute of Technology, 2013. 李伶俐, 李文, 朱伟, 等. 喷施高锰酸钾对棉花生理特性及产量、品质的影响[J]. 河南农业科学, 2017, 46(1): 48–52. Li L L, Li W, Zhu W, et al. Effects of spraying potassium permanganate on physiological characteristics, yield and quality of cotton[J]. Journal of Henan Agricultural Sciences, 2017, 46(1): 48–52. 刘星, 张文明, 张春红, 等. 土壤灭菌–生物有机肥联用对连作马铃薯及土壤真菌群落结构的影响[J]. 生态学报, 2016, 36(20): 6365–6378. Liu X, Zhang W M, Zhang C H, et al. Combination of the application of soil disinfection and bio-organic fertilizer amendment and its effects on yield and quality of tubers, physiological characteristics of plants, and the soil fungal community in a potato monoculture system[J]. Acta Ecologica Sinica, 2016, 36(20): 6365–6378. 王青青, 胡艳丽, 周慧, 等. 根皮苷对平邑甜茶根系TCA循环酶的影响[J]. 中国农业科学, 2012, 45(15): 3108–3114. Wang Q Q, Hu Y L, Zhou H, et al. Effects of phloridzin on the tricarboxylic acid cycle enzymes of roots of Malus hupehensis Rehd [J]. Scientia Agricultura Sinica, 2012, 45(15): 3108–3114. 毛志泉, 沈向, 刘恩太, 等. 一种降解根皮苷的方法[P]. 中国专利: CN102726269A, 2012-10-17. Mao Z Q, Shen X, Liu E T, et al. A method for the degradation of phloridzin[P]. Chinese Patent: CN102726269A, 2012-10-17. 郭素娟, 李广会, 吕文君, 等. 锰对板栗实生苗生长及生理效应的影响[J]. 植物营养与肥料学报, 2012, 18(6): 1530–1536. Guo S J, Li G H, Lü W J, et al. Influence of manganese on growth, physiological effects of chestnut seedlings[J]. Plant Nutrition and Fertilizer Science, 2012, 18(6): 1530–1536. 庄敬华, 陈捷, 杨长成, 等. 生防木霉菌生物安全性评价[J]. 中国农业科学, 2006, 39(4): 715–720. Azarmi R, Hajieghrari B, Giglou A. Effect of Trichoderma isolates on tomato seedling growth response and nutrient uptake [J]. African Journal of Biotechnology, 2011, 10: 5850–5855. Asaduzzaman M, Alam M J, Islam M M. Effect of Trichoderma on seed germination and seedling parameters of chili [J]. Journal of Science Foundation, 2013, 8: 141–150. 冯程龙, 王晓婷, 康文晶, 等. 利用小麦秸秆生产木霉分生孢子及其生物有机肥对黄瓜的促生效果[J]. 植物营养与肥料学报, 2017, 23(5): 1286–1295. Feng C L, Wang X T, Kang W J, et al. Trichoderma conidia production using wheat straw and growth promoting effect of its bio-organic fertilizer on cucumber[J]. Journal of Plant Nutrition and Fertilizer, 2017, 23(5): 1286–1295. 康萍芝, 张丽荣, 沈瑞清, 等. 哈茨木霉制剂对设施连作番茄根际土壤微生物的生态效应及防病作用[J]. 农药, 2013, 52(2): 128–131. Kang P Z, Zhang L R, Shen R Q, et al. Ecological effect of Trichoderma harzianum preparations on rhizosphere soil microbes in facilities continuous cropping tomato and their disease prevention [J]. Agrochemicals, 2013, 52(2): 128–131. 袁玉娟, 胡江, 凌宁, 等. 施用不同生物有机肥对连作黄瓜枯萎病防治效果及其机理初探[J]. 植物营养与肥料学报, 2014, 20(2): 372–379. Yuan Y J, Hu J, Ling N, et al. Effects and mechanisms of application with different bio-organic fertilizers in controlling Fusarium wilt of cucumber [J]. Journal of Plant Nutrition and Fertilizer, 2014, 20(2): 372–379. 毛志泉, 王丽琴, 沈向, 等. 有机物料对平邑甜茶实生苗根系呼吸强度的影响[J]. 植物营养与肥料学报, 2004, 10(2): 171–175. 尹承苗, 王功帅, 李园园, 等. 连作苹果园土壤真菌的T-RFLP分析[J]. 生态学报, 2014, 34(4): 837–846. Yin C M, Wang G S, Li Y Y, et al. Assessment of fungal diversity in apple replanted orchard soils by T-RFLP analysis[J]. Acta Ecologica Sinica, 2014, 34(4): 837–846. 王艳芳, 付风云, 李家家, 等. 甲壳素对连作条件下平邑甜茶幼苗生长及土壤环境的影响[J]. 生态学报, 2016, 36(19): 6218–6225. Wang Y F, Fu F Y, Li J J, et al. Effects of chitin on the growth of Malus hupehensis Rehd. seedlings and soil environment under replant condition [J]. Acta Ecologica Sinica, 2016, 36(19): 6218–6225. 李天来, 杨丽娟. 作物连作障碍的克服-难解的问题[J]. 中国农业科学, 2016, 49(5): 916–918. Li T L, Yang L J. Overcoming continuous cropping obstacles-the difficult problem[J]. Scientia Agricultura Sinica, 2016, 49(5): 916–918. 张素素, 徐少卓, 孙申义, 等. 土壤中根皮苷和根皮素对桃幼苗的影响[J]. 园艺学报, 2017, 44(6): 1167–1173. Zhang S S, Xu S Z, Sun S Y, et al. Effects of phloridzin and phloretin on prunus persica grafted seedlings[J]. Acta Horticulturae Sinica, 2017, 44(6): 1167–1173. 李艳娟, 刘博, 庄正, 等. 哈茨木霉与绿色木霉对杉木种子萌发和幼苗生长的影响[J]. 应用生态学报, 2017, 28(9): 2961–2966. Li Y J, Liu B, Zhuang Z, et al. Effects of Trichoderma hazianum and T. viride on seed germination and seedling growth of Chinese fir [J]. Chinese Journal of Applied Ecology, 2017, 28(9): 2961–2966. 徐文凤. 环渤海湾地区重茬苹果园土壤真菌群落多样性及生防真菌的筛选[D]. 山东泰安: 山东农业大学硕士论文, 2011. Xu W F. Diversity analysis of soil fungi from Bohai Bay apple replanted orchard and the screening of the antagonistic fungi[D]. Tai'an, Shandong: MS Thesis of Shandong Agricultural University, 2011. 徐文, 黄媛媛, 黄亚丽, 等. 木霉-植物互作机制的研究进展[J]. 中国生物防治学报, 2017, 33(3): 408–414. Xu W, Huang Y Y, Huang Y L, et al. Advances on mechanism of Trichoderma-plant interaction[J]. Chinese Journal of Biological Control, 2017, 33(3): 408–414.